Quick post today. Much like when I gathered a group of Autobots at random or a collection of Decepticons lying about, today I feature another random assortment of Decepticons scattered around the house. Most of these figs are from unrelated continuities, but they make up a decent Decepticon force that the Autobots should not underestimate. 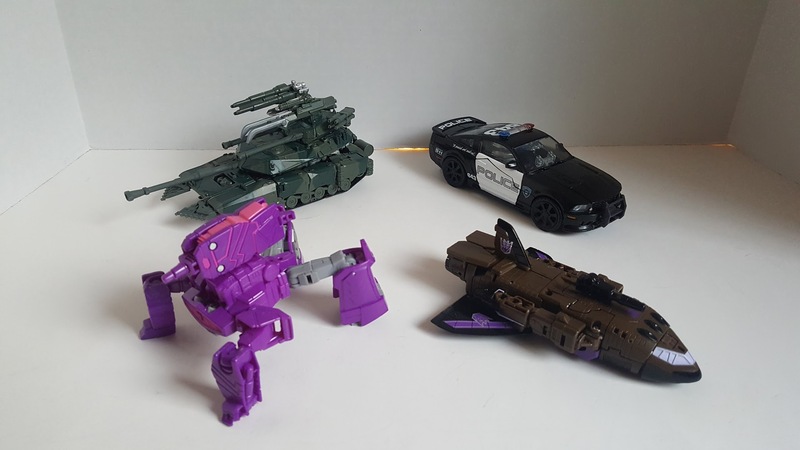 Barricade is the police car of the bunch, but if you’re a fan of Movie TFs then you already knew that. Barricade made his appearance way back in the first Movie, being one of the first Decepticons introduced and having that memorable chase scene with Bumblebee. I have mentioned before that I am impressed by none of the Barricades made thus far. Well, that all changes with this Masterpiece Barricade. This Barricade is the real deal, worthy of the Masterpiece designation. He’s made from high quality plastic, and the toy feels solid and weighty in your hands. The details of the figure are top-notch. Transformation is nothing short of superb. It’s not overly difficult, but it does pose a decent challenge for even the experienced TF veteran. This is a figure I should review, but I’ll just state real quickly here that this is the only Barricade you need in your collection. Continuing with Movie figs, this Brawl is from the Studio Series line of figures. Brawl does belong in the same TF continuity as Barricade, but these two figs are from different toy lines. For those that don’t know, Brawl is the tank. This Brawl figure is not bad. I like both his modes. He has enough weapons to accurately represent his on-screen persona. The engineering put into this figure is to be commended. Transformation is refreshing. Not terribly difficult, but definitely not for the faint of heart or for the impatient. Size wise, I feel he’s a tad too small. I know they are going for a different scale int he Studio Series figures, but even by that standard he’s too small in my opinion. SS Brawl should have been bigger like Leader Class Brawl from the first Movie. I should dig out that Brawl and compare the two figures. This is the Blast Off figure that we should have got in Combiner Wars. CW Combaticons was released some years ago, but the Blast Off figure released was just a repaint of Aerialbot Slingshot. That Blast Off transformed into a jet, and not a space shuttle. I ranted about Hasbro’s strange decision in this post, so I won’t do it again here. I’m just glad that Amazon stepped up and gave us the Blast Off that was Japan only up til now. Yep, it’s Amazon to the rescue again, much like they did Quickslinger (Slingshot) and Brake-Neck (Wildrider). This Blast Off is a nice figure. He is very G1 show accurate, in terms of his aesthetics. The paint job is impressive for a mass retail release. There are some new engineering in this figure not seen in other CW figs, such as the feet and shuttle nosecone transformations. But of course the best feature of this figure is that he transforms into a space shuttle. 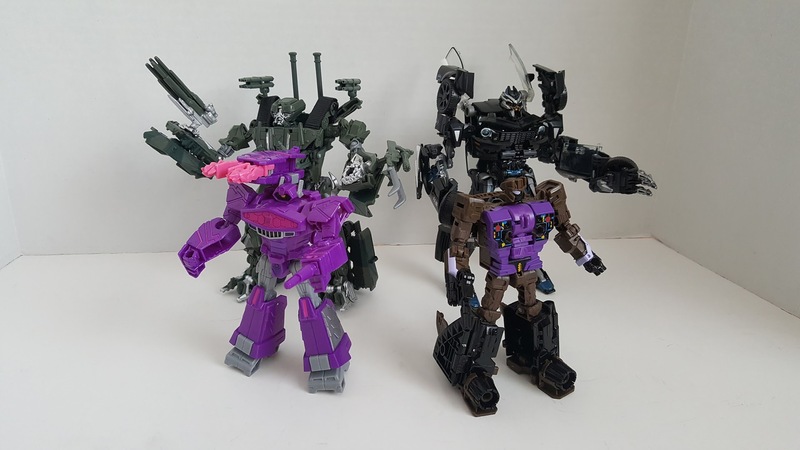 I have not tried to combine him with his fellow Combaticons, but I don’t expect there to be any issues. The bright purple figure here is Shockwave. But he needs no introduction for anyone even remotely familiar with TFs. As of this writing, this is my first and only figure from Cyberverse. This Cyberverse is based on the new show, and have nothing to do with the subline of figures that appeared under Transformers Prime. The new Cyberverse line of figures caught me totally by surprise. I was not expecting them at all, then one day out of the blue I just saw them at Target. Ultimate class Optimus Prime and Megatron were the first two figs I saw. Then slowly, the Warrior class figs appeared. Many fans recommended this Warrior class Shockwave, so I got one. This is a very playable figure. I have probably transformed him like 10 times now. I dig the robot mode. His looks are very G1. I actually really like the shoulder mounted cannon gimmick. The “lasers” flip out from inside the launcher when the assembly is rotated from the back to the shoulder. Shockwave doesn’t have any head articulation, something sorely lacking by today’s standards, even in this basic class. I don’t like this alt mode all that much, I wish he was still his G1 style cannon. All in all, this Warrior class figure feels very much like a Robots in Disguise figure. It’s a light-weight figure made from cheap plastic and cobbled together with ball joints. Luckily for Shockwave, the design of the figure is decent, which saves it from being a total fail. I am however hesitant on buying more Cyberverse figs. They’re meant to be toys and not meant for the mature collector. Decepticons, Transform and Roll Out.